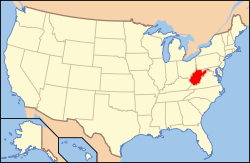 The Buffalo archeological site is located nearby Buffalo, Putnam County, West Virginia along the Kanawha River in the USA. 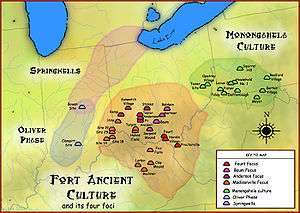 The location is a multi-component site having Archaic village (4000–1000 BC), one Middle Woodland village (AD 390–530), and at least two overlapping Fort Ancient villages (AD 1300–1600). The site is listed on the National Register of Historic Places. The Buffalo (46PU31) Fort Ancient Tradition site is of a phase with several likeness sites of the Clover Complex. As with Clover, the type site, was excavated by the Geological Survey of 1963. Clover Site (46CB40), Buffalo (46PU31) and Rolf Lee (46Ms51) are suspected to be the same population rotating to each location upon resource depletion, firewood and soil (Maslowski). The Buffalo site houses surrounded centralized plaza within the log palisades. At least two different overlapping oval villages were found having more than 40 houses (Hoffman 2010). Edward V. McMichael (WVU) of the 1963 and 1965 West Virginia Geological and Economic Survey uncovered with his team ceramic, stone, shell, animal bone artifacts along with copper artifacts, glass trade beads. The majority of burials were alongside the houses walls rather in a stacked way. A much less number of burials extended beyond the latest village. Dr Michael (WVU) found a few bodies with arrowheads embedded within. This also gives evidence of a culture changing. This very late protohistoric period dated to about 350 B.P. (MicMichael 1968:34,45). The found Buffalo Mask and exotic marine shell gorgets give evidence of contact with the Late Mississippian culture. This Southern Cult or Chiefly Warfare Cult is similar to that of eastern Tennessee and north Georgia region. The earlier temporal village dated before 1550 CE which yielded no pottery made with legs nor lizard effigy on the rims nor exotic crafted artifacts. Although, the pottery was shell tempered and of late found to be worked with corn cob. As with other phases within the contemporaneous 'Tradition,' local stream mussel shell was used for tools and jewelry. Animal bone and shell attached to prepared tree limbs were also used for hoes in their gardens. Animal bone was shaped for use as tools. These included awls, punches, fish hooks, bone needles, and hide scrapers. Their jewelry included beads, hair pins, pendants, tinklers, and shell gorgets. These were also made of both bone and shell. Gourds from their garden and turtle shell were used for ceremonial rattles. ↑ Guilday(1971); McMichael (1963); 46PU31; Buffalo Site; Clover; UGA-304; 270; 120; AD 1680; AD 1651; 299; Broyles 1976:5, Hemmings 1985 "Archived copy". Archived from the original on 2011-08-20. Retrieved 2010-09-17.